Optical systems with high-speed lasers, analog transmission (CATV), or Raman amplifiers require high return loss for maximum performance. Furthermore, optical return loss measurements can be used to prove that an installation was completed carefully and accurately. The ultra-sensitive power meter combined with stabilized light sources enable up to a 70 dB measurement range. 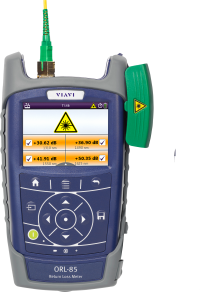 The angled single-mode test port (APC) guarantees highly accurate return loss measurements without requiring external termination for up to 50 dB return loss measurements.